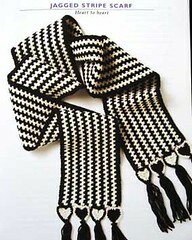 This is what I sent to my knitting swap pal. I recently joined the Holiday 2007 Swap on ravelry. I do hope my swap pal will enjoy this authentic small piece of Turkey. 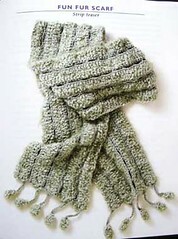 I didn't include in the picture the green (her favorite color) shades skein of very soft yarn. 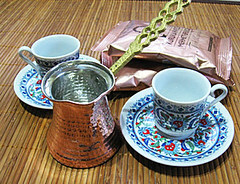 You can see 2 bags of Turkish coffee, a hand made brass ibrik (coffee pot), 2 tiny cups for coffee made from the finest Turkish porcelain in Kutahya. 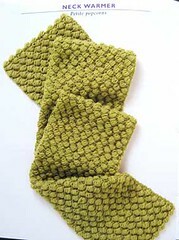 I also included a scarf pattern for that green yarn. Ta-da! I finished this project last evening. 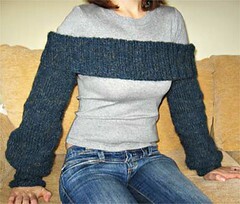 It was a fast and easy knit: only 2 rectangles, one with a very very loose bind off to get the scoop neck for front part. I like it a lot. 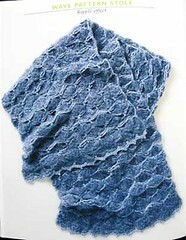 The only thing that makes the difference here is working with 2 types of fiber: one very thin and the other very thick. 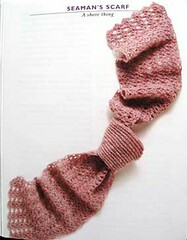 (in my case, the thick is, in fact, a thick-thin yarn which creates lovely bumps). I used 12 mm (US 17) circular needle. I am lucky to be a ravelry member. 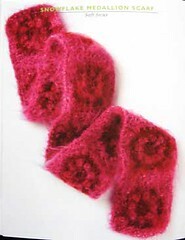 Ravelry is a huge online knitting and crochet community. 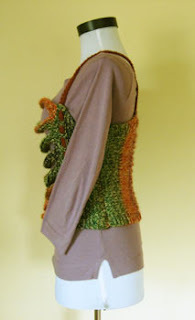 My username on ravelry is craftylady. I've already started a group Knitting Turkey. 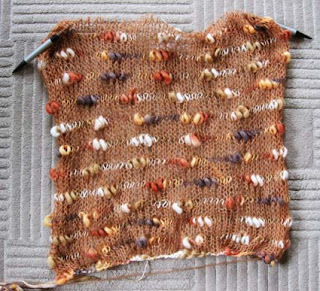 It is a place for knitters who live, lived, will live in Turkey or are somehow connected to Turkey. This group is for anybody interested in traditional Turkish stitches and patterns, Anatolian fair-isle, fabulous Turkish yarn, a guide to buying yarns in Turkey, etc. 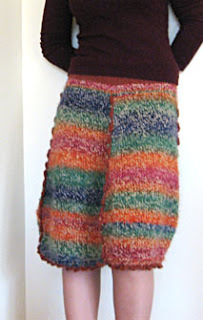 This is my own pattern, inspired from Sabinette scarf, a Norah Gaughan design found on berroco's site. 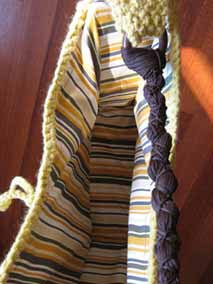 After I finished the front panel, I picked up stitches along one side and continued to work horizontally. 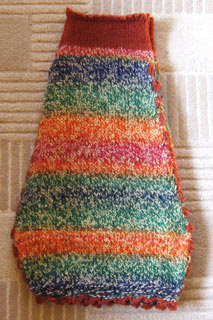 I worked 5 edge (both edges) stitches in garter stitch. The middle of back has 5 rows of eyelet (yo, p2tog on WS) to avoid shrinkage. Look what my dear hubby brought to me: a model form to help with my knitwear design. 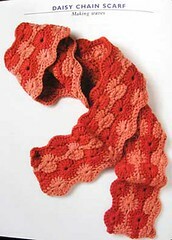 This book is small as a size only, because its content is very rich: 25 crochet patterns for scarves, shawls, wraps and stoles. The projects range from beginner to experienced skill level. 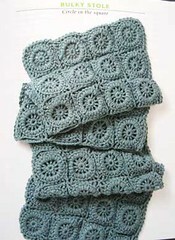 I was pleasantly surprised to see among the designers famous names: Norah Gaughan (there are 2 designs of her), Teva Durham with a very intriguing free form scarf, Mari Lynn Patrick, Sasha Kagan, Katherine Fedewa. Definitely there is something for everybody and this book in very inspiring too: nice color combinations, nice stitches which can be used in other projects too, nice yarns combination. 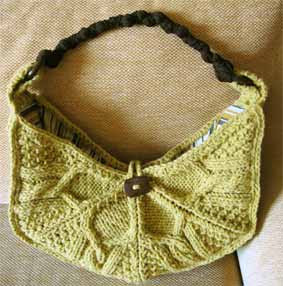 I hesitated a lot before writing a review for Knitting Nature by Norah Gaughan . I was afraid that I can’t put in the true beauty of this book. 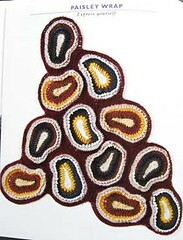 This book is far beyond knitwear designs inspired from nature. 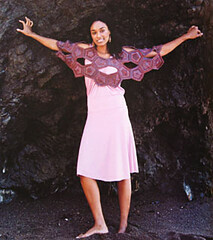 It shows new, innovative and unusual ways of garment constructions. The patterns are not for a beginner, but a beginner knitter can buy this book and knit the garments when becomes more experienced as I am sure the patterns in this book won’t get old-fashioned. 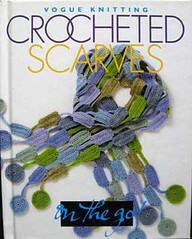 After seeing and contemplating Norah’s designs in this book, I am so proud to knit. Knitting is no more only for bored stay-at-home grandmas, hand knitting means fashionable garments, eye-catching and intriguing designs. 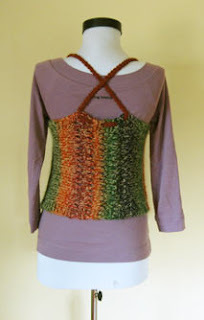 There are cardigans, sweaters, tops, tanks, tunics, pullovers, skirts, hats, scarves, ponchos, mittens, afghans, all in 39 superb designs from a beautiful mind. I haven't been knitting since sooooo long but not because I am lazy. I have been painting for a custom order since one week. 21 boxes to match the furniture in one room for a special customer. My main concern is now how to ship them from Istanbul to Austin, Texas. I approximate the total weight to 30 kg (66 lbs). When ready, I'll post picture with my creations. 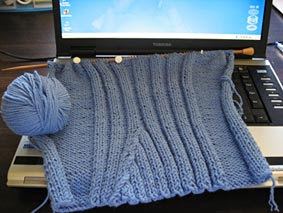 In the meantime, I miss my dear knitting needle. 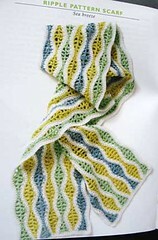 I recently received "Knitting Nature" by Norah Gaughan. I usually don't write reviews, but, when I'll have some spare time, I want to write down my thoughts on this amazing book. Today I am 32 years old. How do I celebrate my birthday? In airports, plane... in few hours I'll be headed to Romania. 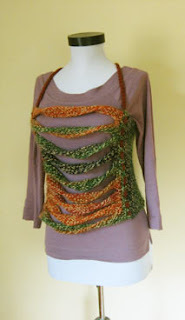 I finished my Latoya tank from berroco. It is very stretchy. I am still not happy with the straps but I was pressed by time so I didn't make any changes. After this project, I realized that I have to improve my finishing techniques. 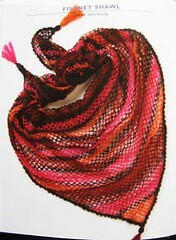 My next project (in September) will be Norah Gaughan's capecho. I am also dreaming of designing something by myself. A tank or maybe a short sleeve sweater. Something simple but chic. 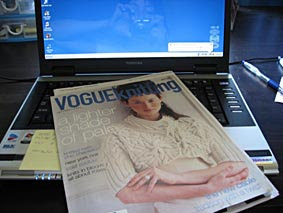 But, yesterday I found in the mailbox the winter issue of VogueKnitting magazine. My friend from Holland, Nadina, sent it to me as an early present for my birthday (thanks Nadina). She knew I was so excited to knit Norah’s capecho. Now I am still undecided: to finish Latoya tank and then to start Norah’s capecho or to have two WIPs same time (which means I won't wear the tank on my birthday). In the above picture, the pattern is repeated twice horizontally. I finished Coachella in 2 days. Personally, I feel the drape hangs too low in the middle that's why I'm wearing it over a white tank. But I like it a lot, it's simple yet elegant. 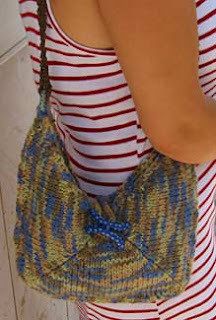 So, for Justine, and not only, my bag stitch pattern. 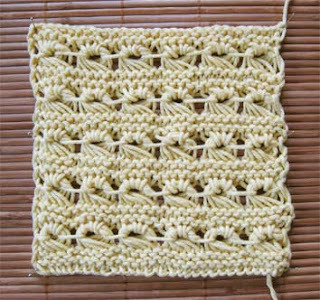 This stitch pattern requires multiple of 5 stitches + 2 extra stitches (border stitches, i.e. one st for each side). 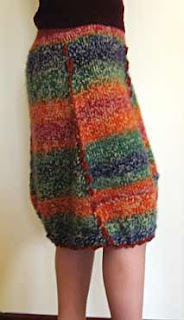 I won't mention the border stitches in the pattern. Row 6: *[Slip 5 sts purlwise to RH needle, dropping same time the yo's from previous row; slip these 5 sts back to the LH needle and Ktbl, do not drop the stitch from LH needle, (yo, Ktbl) twice in the same stitch. Now pass(dropp) all the 5 sts to the RH needle.] Repeat from * till end of row. Now you should have the same no of sts on yr needle. For the swatch in the above picture, I casted on 32 sts (30 sts + 2 border sts). If you still have questions regarding this stitsch pattern, pls let me know. I hope my friend will love it. This bag is her birthday present. It was a total challenge: knit, paint the wooden rings, make the handles somehow, use X-ray films to keep the lining&bag sturdy.